It’s crazy the way the Philippine government coddles these jeepney drivers. They are mere pawns in a vast decades-long campaign of emotional blackmail Filipino commies have subjected Filipinos to on a national scale. And yet, though these World War II era contraptions have been pitched across as a “public utility” that “serves” Filipino commuters, they are anything but. They are national parasites just like the commies that back their “plight”. The usual liberal “cause-oriented” groups that form the outer rim of commie hardliners express concern over the loss of jeepney drivers’ “livelihood” if ever these vehicles are eradicated from the face of the Philippines. This obsolete notion, together with the capacity for militant “action” the Leftist community continues to wield, paralyse Philippine industry. And it is not just during these idiotic “transport strikes” that the economy suffers. It is the long-term effect of maintaining an abominably inefficient and environmentally-degrading public transport system that sustains the wretched state of life in the country’s big cities. Like squatters, jeepney drivers are parasites. They are beneficiaries of Philippine society’s chronic inability to develop and implement innovative solutions to ordinary problems. Mass transportation — like public housing — is an ordinary problem. Its ordinariness is evident in the way many other countries have managed to get it right (or at least are getting there). But like many ordinary problems Filipinos continue to routinely fail to solve, efficient public transport remains beyond the reach of Filipinos’ collective intellectual faculties. And so here we are — Filipinos imprisoned by a really bad jeepney infestation. How long will Filipinos continue to put up with a “cultural icon” that has turned into a pathetic national embarrassment? Probably for another five decades at least. You can’t eradicate pestilence by killing individual bugs. The answer lies in killing the queen termite. Unfortunately for Filipinos, the queen termite in this jeepney infestation is their entire political system and cultural mindset. Jeepney drivers are a cultural phenomenon much the same way the notion of zombies have come to be regarded as cultural icons that mirror Western collective anxieties. When large numbers of the living start dressing up as the undead, they are announcing a true cultural phenomenon. It may seem like a fad, but zombies matter–not just in the sociology of pop culture but in how we collectively orient ourselves toward the future of civilization itself. Pondering the zombie apocalypse is a form of shared emotional preparation–a collective therapy–for facing bad things to come. It is also, ironically, society’s only working pathway to real-world, worst-case strategic analysis. And as Americans, in particular, it is our clearest window into our own dark side–and at the same time, a potential key to national renewal. The difference is that, for now, zombies are fictitious phenomena. Unfortunately for Filipinos, jeepney drivers are real. They are a monstrous socio-economic problem that Filipinos cannot escape yet, at the same time, are a product of Filipino culture itself. They are the evil spawn of the dark underbelly of the Filipino psyche and represent the confronting reality an entire people need to face — that they are held prisoner by their own lack of imagination, misplaced liberalism, and stunted capacity for problem solving. The core conceptual pillar of this latest “transport strike” is no different to any such strikes in the past. It is an appeal to consider the “livelihood” of these “hapless” social parasites. It is like a colony of termites demanding that a homeowner be considerate to their need to consume wood. It just does not make any sense. jeepney never really contributed to the society. only stupid poor people ride on them. When the great American inventor, Thomas Edison, invented the incandescent lamp (light bulb). Many lamp makers and candle makers, may had been upset. Their livelihoods, were being phased out by the new lighting technology. The Philippine Jeepney is a relic, of World War II transport , left by the liberating American Forces. The engines were designed, when the cost of a gallon of gasoline was 5 cents per gallon. They pollute the atmosphere, with a lot of carbon dioxide. Okay, we don’t have to kill each other, or tear each other’s hair; because some people in our country are losing livelihood. Let us formulate a solution to this problem. Why not improve the design of the Philippine Jeepney ? It will not be a phase out, but an improvement in our transport system . Hoping this will satisfy everybody ! Thanks Mr. Toro! I appreciate the very educated comment. Can’t say the same for the first one before you though. It does not contribute anything substantial to humanity other than the hollow arrogannce of an uneducated imbecile’s stupid hinking! We, GRP Bloggers, who are knowledgeable in Technology must help in the formulation of the improvement of the design of the Philippine Jeepney… Project: Evolution of the the Philippine Jeepney. I saw the previous designs of morphed Jeepneys, not good and viable in Philippine roads and streets ! I know some Filipinos, are knowledgeable in Manufacturing Technology. Actually, that is what is happening right now. The government is actually proposing a modernization plan for our Jeepneys, not phasing them out. That equates to better Jeep designs that are (hopefully) more environment friendly. Ideally, none of the current Jeepney drivers would lose their jobs as they would just get an upgrade to their current vehicles. Problem with the protests is that the higher ups on PISTON may be misleading their drivers to think they’ll be put out of their jobs if this “modernization plan” continues. I’ve seen some news earlier this year that the drivers have either no idea what they’re protesting about, or were led to believe they’ll lose their job if the government plans come to fruition. One valid (??) concern raised against the modernization plan is that the Jeepney transportation will have become privatized and monopolized, though to me it does sound like they’ll now be “properly employed”. Another actually legitimate concern is that the government modernization plan will cost the drivers and operators the upgrade, with potentially years of “pasada” to pay the jeeps. That in turn would cause a spike in transport fares which would hurt the commuting public. In my opinion, the government shouldn’t give the burden of the Jeep’s upgrade cost entirely to the driver / operator, but instead the govt should shoulder most of the upgrade cost, then just leave the maintenance costs to the drivers and their mechanics (who should also learn about the new workings of the upgraded jeep). That way we won’t have a significant increase in transport fares, at most P10 regular fare and no further. We already have and ready to be driven on our roads. Hopefully, President Duterte is very serious about capturing those jeepney drivers who doesn’t want to replace their old, dilapidated & dangerous PUJs & drive with those modernized, spacious & eco-friendly jeeps by 2018 and send them to jail, especially to the leftist/commie groups who are against his modernization program of Pinoy jeepneys or better yet, death by hanging or firing squad for those who are ignorant & undisciplined jeepney drivers & commies!!! Sometime ago a taxi driver related a story that he once had a korean passenger who said to him, “Your Government must be anti-poor!”. He said that, if in Korea, they would rather have built a mass rail transport system that will surely benefit more people. If in case you haven’t notice it, the Skyway’s design provides an nice exit straight to Alabang Villages of rich car owners, enabling them to avoid traffic. I assume it’s a place where many officials and friends associated in government resides. Gawa yan ang mga Aquino and cahoots. They had only plans for themselves . Common people are treated like those Feudal peasants in the Middle Ages. We are still a Feudal Oligarchy ! Cory Aquino was a Haciendera. His idiot son, Pnoy Aquino is a Haciendero. They don’t know what is to be poor …They are pampered by good living and servants, in their lives. What they know is to waste money…spend our tax money. It is not their money , anyway ! true & it was started way back during the Ramos Administration. Thank God that President Duterte is giving a green light on building a 1st subway system in Metro Manila but we need that one more that could cover the entire NCR so that there’ll be a better service to the people as long as the subway trains are on high quality and never been stolen to the pockets of corrupt gov’t officials. We need a political will on this kind of public transportation projects! If jeepney drivers, likened to squatters, are national PARASITES; those who are pushing for the modernization proposal (big corporations to take over the jeepney industry and, just like the telcos, monopolize the public transportation system) and are bound to benefit from huge contracts in millions will be national SUCKERS and LEECHES! That’s according to those who do not find the modernization plan, which Sec. Tugade called a “gift” from the government, as acceptable. Change is good! Would any right-thinking individual resist change provided that change would be made realistically viable and feasible? Assuming that Php 80,000 is the government’s share to 5% equity; the full price of the modernized jeepney at that point (100% equity) is at Php 1,600,000. Adjust for interest, the government subsidy, and payment terms, Php 1,600,000 can balloon to a payable of almost P2,192,000 in 7 years. Which means that a jeep has to be paid Php 313,142.86 peryear, Php 26,095.24 per month, and Php 869.84 per day. Given that, at Php 8.00 minimum fare, a jeepney has to accomodate 109 passengers to offset the payment for the loan, every single day for the next 7 years. The modern jeepney can accomodate up to 22 people. Given that, a modern jeepney has to give five full round trips to offset the loan for the next 7 years. That’s not even adjusted for (1) costs such as fuel, not to mention (2) income, (3) boundary costs, and (4) other indirect expenses. With the modernization program, the intentions are good! But, will it finally help solved traffic and other problems? Finally, is this the BEST the Government can actually offer?! To be exact php22,205 per month for 1.6M. As per my knowledge and information that after the implementation of modernization that boundary costs will be eliminated. And if the modern jeepney is electric then maintenance cost is minimize also. This is better change than nothing. So… what solution do you propose to address this situation? The Jeepney nowadays would have been okay transportation option if it wasn’t modernized after 1960, you would think technology and innovation would improve such an icon that started after WWII but sadly the opportunity is met with fierce resistance. These folks hate change and ironically ask someone else to do it and be given on a silver platter. I get the point that they were trying to get with the transpo strike but like my father and I talked about often: these people just makes noise and in the end, it wouldn’t matter at all. There are electrically-powered jeepneys that serve as shuttles at De La Salle University – Dasmarinas campus. These jeepneys are *quiet* and emit zero smog! These are the only types that should be allowed. There are vehicles that run on Hybrid Engines. That is , powered by: part gasoline and part electric. Motor vehicles, mostly need direct current electricity. So, the Inverter is not needed. We need our Technically Educated people, to design this vehicle. Anyone ? yes, we need Elon Musk in our country & he should invest his company, Tesla Motors here in the Philippines & send his group of experts & educate the Filipino engineers here. Why not the Government handle their own transport system and get those drivers as employees? It’s going to be like our taxes used to pay for those vehicles, government will manage it, and the drivers will be paid like ordinary government employees. Since big transport systems take years to finish (like MRTs, LRTs), why not experiment on a project for a particular City here in NCR, eliminate all jeepneys, take the drivers, and see if it works. Yeah, it’s our tax, but hey, who knows where it is going now anyway, at least we, the private sector employee commuters, get to benefit from that hard-earned-salary-sourced tax. The only thing more dangerous than ignorance is the pretense of intelligent ignorance. The former is teachable; the latter is not. A pathetic article. 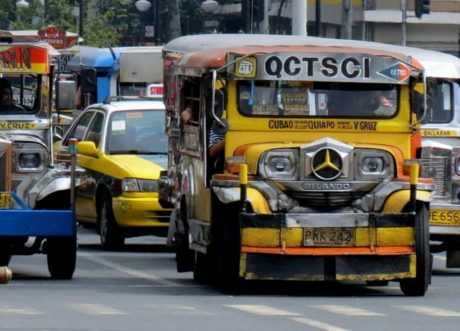 Jeepnets are huge polluters and driven selfishly like every vehicle in Manila – there are no saints on the roads in the Philippines; you’re all terrible selfish polluting drivers so why single out jeepney drivers? Jeepneys are full of passengers which tells you that they serve a need. How do you expect the poor jeepney driver to change the system? Leadership and change must be driven from the top ….. so in the Philippines, don’t expect anything to change.